Acute kidney injury (AKI), which is a major complication after cardiovascular surgery, is associated with significant morbidity and mortality. Diuretic agents are frequently used to improve urine output and to facilitate fluid management in these patients. Mannitol, an osmotic diuretic, is used in the perioperative setting in the belief that it exerts reno-protective properties. In a recent study on uncomplicated postcardiac-surgery patients with normal renal function, mannitol increased glomerular filtration rate (GFR), possibly by a deswelling effect on tubular cells. Furthermore, experimental studies have previously shown that renal ischemia causes an endothelial cell injury and dysfunction followed by endothelial cell edema. We studied the effects of mannitol on renal blood flow (RBF), glomerular filtration rate (GFR), renal oxygen consumption (RVO2), and extraction (RO2Ex) in early, ischemic AKI after cardiac surgery. Eleven patients with AKI were studied during propofol sedation and mechanical ventilation 2 to 6 days after complicated cardiac surgery. All patients had severe heart failure treated with one (100%) or two (73%) inotropic agents and intraaortic balloon pump (36%). Systemic hemodynamics were measured with a pulmonary artery catheter. RBF and renal filtration fraction (FF) were measured by the renal vein thermo-dilution technique and by renal extraction of chromium-51-ethylenediaminetetraacetic acid (51Cr-EDTA), respectively. GFR was calculated as the product of FF and renal plasma flow RBF × (1-hematocrit). RVO2 and RO2Ex were calculated from arterial and renal vein blood samples according to standard formulae. After control measurements, a bolus dose of mannitol, 225 mg/kg, was given, followed by an infusion at a rate of 75 mg/kg/h for two 30-minute periods. Mannitol did not affect cardiac index or cardiac filling pressures. Mannitol increased urine flow by 61% (P < 0.001). This was accompanied by a 12% increase in RBF (P < 0.05) and a 13% decrease in renal vascular resistance (P < 0.05). Mannitol increased the RBF/cardiac output (CO) relation (P = 0.040). Mannitol caused no significant changes in RO2Ext or renal FF. Mannitol treatment of postoperative AKI induces a renal vasodilation and redistributes systemic blood flow to the kidneys. Mannitol does not affect filtration fraction or renal oxygenation, suggestive of balanced increases in perfusion/filtration and oxygen demand/supply. Acute kidney injury (AKI) complicates 15% to 30% of cardiac surgeries and is associated with significant morbidity and mortality [1–4]. Even minor changes in serum creatinine are associated with increased inpatient mortality [5, 6]. Impaired renal oxygen delivery, caused by intraoperative hypotension and hemodilution-induced anemia and postoperative low cardiac output, is considered to be the cause of postoperative AKI in this group of patients [4, 7]. The renal medulla is at the border of hypoxia under normal conditions, due to the concentration mechanism, and therefore particularly sensitive to ischemia [8, 9]. It was recently shown that renal oxygenation (renal oxygen supply/demand relation) is severely impaired in patients with early AKI after complicated cardiac surgery , in turn, caused by a 50% increase in renal vascular resistance, compared with uncomplicated postcardiac-surgery patients. From experimental studies, it has been suggested that renal vasoconstriction in AKI is caused by afferent arteriolar vasoconstriction mediated by the tubuloglomerular feedback mechanism, vasoconstrictors (catecholamines, angiotensin II, endothelin), and outer medullary congestion. Furthermore, it has been ascribed to ischemic endothelial cell injury, causing an imbalance in the production of endothelin and endothelial nitric oxide, or to angiotensin II-induced activation of reactive oxygen species that inactivates NO [11–13]. Finally, it has been suggested that outer medullary hypoxia may cause endothelial ischemic injury and cell swelling, contributing to congestion and impaired perfusion of this region . It would therefore be logical that interventions that alleviate this afferent arteriolar vasoconstriction would be beneficial, as they could potentially increase RBF and GFR. Oliguria is a poor prognostic indicator in patients with AKI [15, 16], and diuretic agents are frequently used to improve urine output and to facilitate fluid management in these patients. Mannitol, an osmotic diuretic, has been used in the belief that it exerts renoprotective properties in patients undergoing surgery. However, results from studies in which mannitol has been evaluated in the perioperative setting, for prevention or treatment of AKI, are divergent. Although mannitol has failed to show a prophylactic effect in patients undergoing abdominal aortic or cardiac surgery [17, 18], mannitol has been shown to reduce the incidence of postoperative AKI in the setting of renal transplantation, along with volume expansion [19, 20]. Furthermore, mannitol treatment has been shown to increase the glomerular filtration rate (GFR) in patients after severe trauma or surgery . In addition, our group recently showed that mannitol increases GFR in postoperative cardiac surgery patients , possibly by a deswelling effect on tubular cells. To evaluate in more detail the potential beneficial effects of mannitol for treatment of AKI in the perioperative setting, our aim was to evaluate the effects of mannitol on GFR, renal blood flow (RBF), renal oxygen consumption (RVO2), and the renal oxygen supply/demand relation in patients with early, ischemic AKI after complicated cardiac surgery. To this end, we used the retrograde renal vein thermodilution technique and renal extraction of 51chromium-ethylene-diaminetetraacetic acid (51Cr-EDTA) for rapid bedside estimation of RBF and GFR without the need for urine collection . In the present study, we tested the null hypothesis that mannitol, in clinically used doses, affects neither RBF nor GFR in patients with AKI after cardiac surgery. The study protocol was approved by the Human Ethics Committee of the University of Gothenburg. Informed consent was obtained from the patient's next of kin before enrolment in the study. Between September 2007 and October 2011, 13 patients who developed AKI after complicated heart surgery were included in the study according to these inclusion criteria: (a) cardiac surgery with cardiopulmonary bypass; (b) normal preoperative renal function (serum creatinine ≤105 µM); and (c) development of AKI, stage 1 or 2, according to the Acute Kidney Injury Network criteria, defined as a 50% to 200% postoperative increase in serum creatinine from baseline . The following exclusion criteria were used: (a) heart transplantation, thoracoabdominal aortic surgery, (c) aortic dissection, (d) use of nephrotoxic drugs such as radiocontrast agents, aminoglycoside antibiotics, or nonsteroidal antiinflammatory drug (NSAID) analgesics. In the intensive care unit (ICU), the patients were sedated with propofol (50.1 ± 3.3 μg/kg/min), treated with morphine or fentanyl, and mechanically ventilated to normocapnia. The hemodynamic and renal management of the patients was at the discretion of the attending intensive care physician. The treatment protocol included inotropic support with milrinone and/or norepinephrine to maintain cardiac index ≥2.1 L/min/m2, whole-body oxygen extraction ≤40%, and mean arterial pressure (MAP) at 70 to 80 mm Hg, with or without an intraaortic balloon pump. A continuous infusion of furosemide (5 to 40 mg/h) was used, if needed, to promote diuresis. Because all patients were sedated, neurologic status was not included in the sequential organ-failure assessment score (SOFA score) . Arterial blood pressure was measured with a radial or femoral arterial catheter. Systemic hemodynamics were measured with a pulmonary artery thermodilution catheter (Baxter Healthcare Corporation, Irvine, CA, USA). Measurements of thermodilution cardiac output were performed in triplicate and indexed to body surface area to derive the cardiac index (CI). The mean coefficient of variation for measurement of CI was 1.6%. The pulmonary artery wedge pressure (PCWP) was measured intermittently. Systemic vascular resistance index (SVRI), pulmonary vascular resistance index (PVRI), and left ventricular stroke volume index (SVI) were calculated according to standard formulae. Sodium was measured potentiometrically with a sodium electrode (ABL800 Flex; Radiometer, Bronshoj, Denmark). The sensitivity limits of the sodium electrode are 90% to 105%. An 8-Fr catheter (Webster Laboratories, Baldwin Park, CA, USA) was introduced into the left renal vein via the right femoral vein, under fluoroscopic guidance. The catheter was placed in the central portion of the renal vein, and its position was verified with venography, by using ultra-low doses of iohexol, 5 to 15 mg I/kg (Omnipaque 300 mg I/ml; GE Healthcare, Stockholm, Sweden) . The technique for measurement of RBF with retrograde thermodilution has previously been described in detail [22, 23, 26, 27]. The total RBF was assumed to be twice the blood flow to the left kidney. After blood and urine blanks were taken, an intravenous priming dose of 51Cr-EDTA (0. 6 MBq/m2 body surface area) was given, followed by an infusion at a constant rate, individualized to body weight and serum creatinine. Serum 51Cr-EDTA activities from arterial and renal vein blood were measured with a well counter (Wizard 300, 1480 Automatic Gamma Counter; Perkin Elmer LAS, Turku, Finland). Urine was collected in 30-minute periods to measure urine flow and sodium excretion. An indwelling Foley catheter drained the urine from the bladder. The levels of 51Cr-EDTA were obtained from arterial and renal vein blood at the end of each urine-collection period. The patients were included in the study from 2 to 6 days after the cardiac surgery. After an equilibration period of at least 60 minutes, two 30-minute urine-collection control periods were started, followed by the administration of mannitol, 150 mg/ml (Mannitol; Baxter Viaflo, Baxter Medical AB, Kista, Sweden). The patients received a bolus dose of mannitol, 225 mg/kg, followed by a continuous infusion of mannitol at a rate of 75 mg/kg/h for two 30-minute urine collection periods. Thermodilution measurements of RBF, hemodynamic variables, as well as blood and urine samples, were obtained at the end of each urine-collection period. During the experimental procedure, the blood pressure was kept constant, and an isotonic crystalloid solution was continuously infused to substitute for fluid losses due to the diuretic response. Based on our previous study , we calculated that 10 patients had to be included to detect a mannitol-induced change in GFR of 20%, at a power of 80% and at a significance level of 0.05, with a standard deviation of 12.2 ml (paired design). Data on renal and hemodynamic variables from the two control periods (C1, C2), as well as the two mannitol-treatment periods (M1, M2) were pooled. The renal and hemodynamic effects of mannitol, compared with control, were assessed with a paired t test. A probability level (P value) of less than 0.05 was considered to indicate statistical significance. The data are presented as mean ± standard error of the mean (mean ± SEM). Thirteen patients were included in the study. Two patients were excluded from the study because of unsuccessful placement of the renal vein catheter. In total, 11 patients were thus evaluated. Baseline characteristics of the patients are presented in Table 1. Serum creatinine had increased by 52% to 158% at the day of study. The patients had a mean SOFA score of 9 (range, 7 to 12). All patients were treated with norepinephrine infusion. Eight (73%) patients were treated with milrinone, 10 (91%) patients had furosemide infusion, and four (36%) patients needed an IABP (Table 2). Two (18%) patients required continuous renal-replacement therapy, and five (45%) patients died during their ICU stay. Data are presented as mean ± SEM. ACE, angiotensin-converting enzyme; BSA, body surface area; CABG, coronary artery bypass surgery; CPB, cardiopulmonary bypass; ICU, intensive care unit; LVEF, left ventricular ejection fraction; nonelective, surgery performed within 24 hours after referral; Preop, preoperative. IABP, intraaortic balloon pump; Preop, preoperative; SOFA, sequential organ-failure assessment. *Mean and SEM among treated. Data obtained during the two control periods, C1 and C2, did not differ in any of the measured variables. Mannitol induced a significant increase in SVI (4%) and significantly decreased Hct (2%) (Table 3). Mannitol caused no significant changes in MAP, MPAP, CI, HR, SVRI, or PVRI and had no effects on filling pressures (CVP, PCWP) . The body temperature did not change during the experimental procedure. Data are presented as mean ± SEM. C1, first control period before mannitol infusion; C2, second control period before mannitol infusion; CI, cardiac index; CVP, central venous pressure; Hct, hematocrit; HR, heart rate; M1, first period with mannitol infusion (150 mg/ml, infusion rate of 0.5 ml/kg/h); M2, second period with mannitol infusion (150 mg/ml; infusion rate of 0.5 ml/kg/h); MAP, mean arterial pressure; MPAP, mean pulmonary artery pressure; PCWP, pulmonary capillary wedge pressure; PVRI, pulmonary vascular resistance index; SVI, stroke volume index; SVRI, systemic vascular resistance index. Mannitol induced a significant increase in RBF (12%) and significantly decreased RVR (-13%) (Table 4 and Figure 1). Mannitol increased the RBF/CO relation (P = 0.040). Mannitol also caused significant increases in urine output (61%) and FENa (58%). Although mannitol tended to increase GFR (16%, P = 0.16), sodium filtration (18%, P = 0.14), tubular sodium reabsorption (14%, P = 0.28), and RVO2 (10%, P = 0.14), none of these changes reached statistical significance. Mannitol affected neither FF nor RO2Ext. Data are presented as mean ± SEM. C1, first control period before mannitol infusion; C2, second control period before mannitol infusion; FENa, fractional excretion of sodium; FF, filtration fraction; GFNa, sodium filtration; GFR, glomerular filtration rate; M1, first period with mannitol infusion (150 mg/ml, infusion rate of 0.5 ml/kg/h); M2, second period with mannitol infusion (150 mg/ml, infusion rate of 0.5 ml/kg/h); RBF, renal blood flow; RO2Ex, renal oxygen extraction; RVR, renal vascular resistance; RVO2, renal oxygen consumption; TRNa, sodium reabsorption. 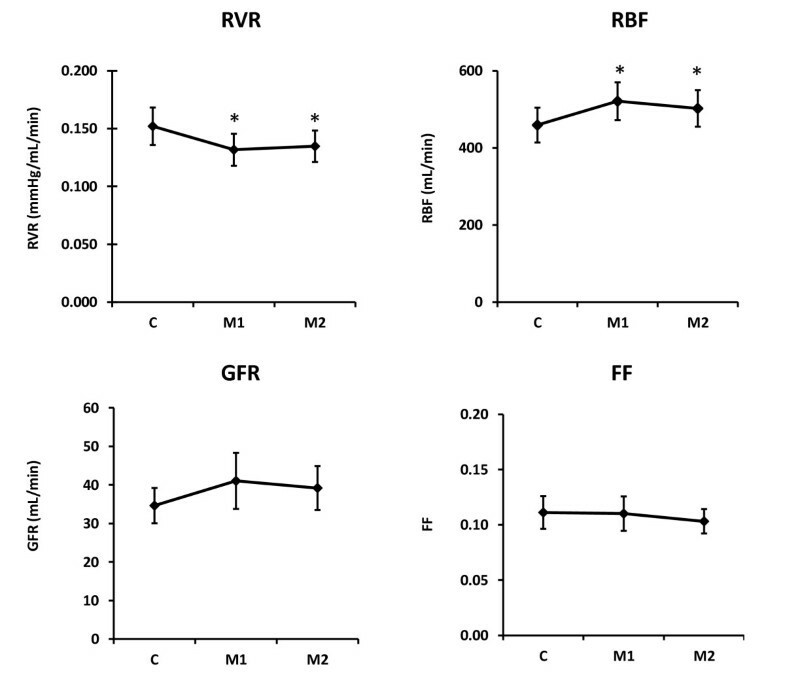 Effects of mannitol (M1, M2) on renal vascular resistance (RVR), renal blood flow (RBF), glomerular filtration rate (GFR), and renal filtration fraction (FF). *P < 0.05. The main findings of the present study on cardiac surgery patients with postoperative early AKI were that mannitol induced a renal vasodilatation and increased RBF with no changes in filtration fraction or the renal oxygen supply/demand relation, as assessed by the lack of effect on RO2Ex. To our knowledge, no previous studies exist on the effects of mannitol on renal perfusion, filtration, and oxygenation in patients with AKI. In most animal studies, it has been shown that mannitol increases RBF by renal vasodilation during both normotensive [29–31] and hypotensive conditions [32–34]. Data on the effects of mannitol on RBF in humans, however, are scarce. With the xenon133 washout technique, Castaneda-Zuniga et al. studied the effects of mannitol (20%) infusion on RBF in humans and demonstrated only a minimal increase in RBF. With the same methods as in the present study, Kurnik et al. studied the effect of mannitol (15%) on RBF in patients with moderate chronic renal failure and found that mannitol did not affect RBF. Those results are supported by a study, recently published by our group, demonstrating no effect of mannitol on RBF, in postoperative uncomplicated cardiac surgery patients with normal renal function . What are the mechanisms behind the mannitol-induced decrease in RVR in early clinical, ischemic AKI, as demonstrated in the present study? It has been suggested that the mannitol-induced renal vasodilatory response to experimental renal ischemia is mediated directly by increased synthesis of prostacyclin, or indirectly by augmenting plasma levels of ANP because of the plasma volume expansion [34, 37]. In the present study, plasma volume expansion with mannitol was not large enough to cause increased cardiac filling pressures at the time of RBF measurements. However, we cannot rule out the possibility that mannitol bolus plus infusion induced a transient increase in cardiac filling pressures and distention, causing a release of natriuretic peptides. In our previous study in postoperative uncomplicated cardiac patients with normal renal function, by using an identical protocol, we found that mannitol did not affect RBF , suggesting that mannitol-induced plasma volume expansion and the consequent cardiac release of renal vasodilatory cardiac peptides is not the main mechanism behind the renal vasodilation, as demonstrated in the present study. Experimental studies have shown that renal ischemia causes endothelial cell injury and dysfunction followed by endothelial cell edema . Flores et al. showed in an animal study that ischemia-induced endothelial cell swelling can be reversed and prevented by mannitol. They suggested that the failure of blood flow to return to the kidney after transient ischemia, the so-called "no reflow" phenomenon, was due to swollen endothelial cells, and that the no-reflow could be corrected by mannitol. Based on those experimental studies, one could therefore speculate that mannitol might exert its beneficial effect on renal perfusion in patients with AKI by a deswelling effect on injured endothelial cells. Treatment of patients with AKI with mannitol did not affect the renal oxygen supply/demand relation, as assessed by no changes in renal oxygen extraction. Thus, the mannitol-induced increase in RBF was matched by a proportional increase in RVO2. It is well known that tubular sodium reabsorption is a major determinant of RVO2 in humans , and it was shown previously that a close association exists between the GFR, tubular sodium reabsorption, and RVO2 in humans [22, 27, 46], and any agent that increases the GFR has the potential to increase the RVO2 [22, 27, 46]. If mannitol affected only RBF in the present study, with no increase in GFR or RVO2, one would have expected a decrease in renal oxygen extraction, as was seen with low-dose dopamine, which increased RBF with no effects on the GFR or the RVO2 . This study has several limitations. One major limitation is that we did not include a time-control group. One could, therefore, argue that changes in the measured renal or hemodynamic variables were not entirely caused by mannitol itself, but also, to some extent, by spontaneous fluctuations or time-dependent effects on these variables. Conversely, data on renal and systemic hemodynamics, as well as on renal function and oxygen metabolism, obtained during the two control periods, did not differ significantly. We, therefore, believe that the effects of mannitol on the measured renal variables in the present study are caused by mannitol and not by spontaneous fluctuations or time-dependent changes of these variables. Another limitation of this study is the relatively small sample size, as discussed earlier. A much larger population of patients must be studied to evaluate whether mannitol may improve renal outcome in AKI. The obvious advantages with the continuous renal vein thermodilution technique are that repeated and rapid estimations of RBF can be performed at the bedside at short intervals. The thermodilution technique is validated against the gold-standard technique, which is the urinary clearance of PAH, corrected for by renal extraction-fraction of PAH . It is neither dependent on a steady state, nor affected by extrarenal elimination or by changes in renal extraction. The thermodilution technique can, hence, be used in intensive care patients to detect dynamic changes in RBF. In the present study of patients with postoperative AKI caused by severe heart failure, requiring inotropic and mechanical support, we showed that treatment with the osmotic diuretic, mannitol, induces a renal vasodilation and increases RBF with maintained filtration fraction and renal oxygenation. This study was supported by grants from the Swedish Medical Research Council, Medical Faculty of Gothenburg (LUA), and Gothenburg Medical Society. All authors participated in the study design. GB collected and prepared the data and performed the statistical analysis. GB and BR performed the renal vein catheterizations and the experimental procedures. All authors participated in writing the paper, and all approved the final manuscript.